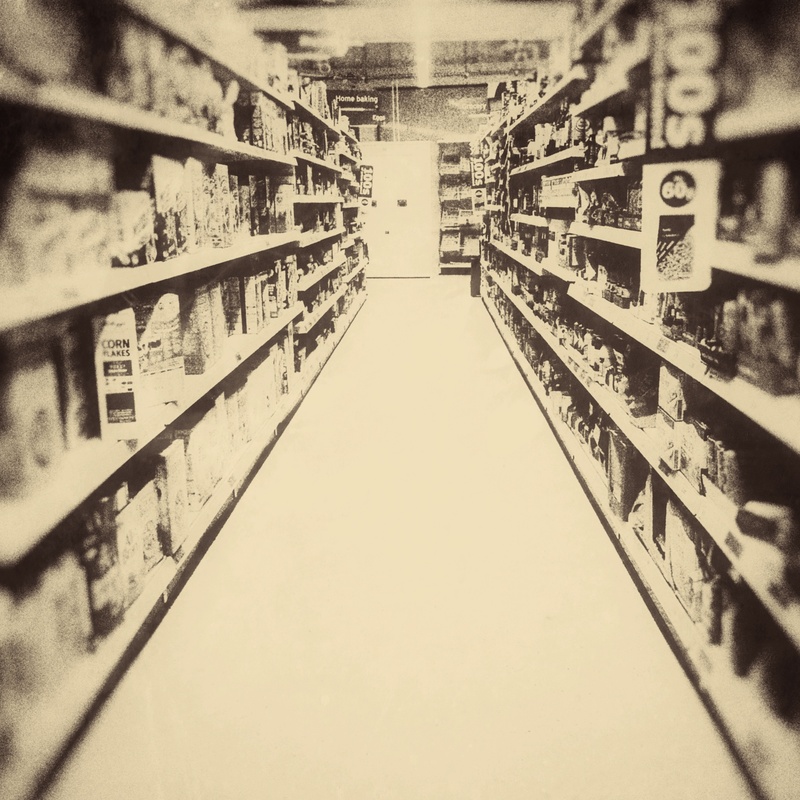 The supermarket convenience store is defined by an absence, by what it is not. The major supermarket convenience store tends to be under 3,000 square feet in size, as any store under that size is not subject to the Sunday Trading Act, and so is free to be open at whatever times it pleases on a Sunday. Sunday evening and we go there, not out of choice, but as everywhere else is shut. We go there, not out of choice, but because we have just finished our shift, or are about to begin our shift, have just seen the cupboard is bare, have an unforeseen need for a bottle of wine, or washing powder, or General Sales List medicines, or need a distraction from the week ahead. We are alone, or fielding tired children, or in tentative couples, platonic, or otherwise. Running errands, running late, running scared. We notice the items not there more than what is well-stocked. We treat ourselves and sometimes retail therapy is the only therapy on offer, and as sad as it is, a trashy magazine or a chocolate bar or a can of beer really, really helps. The staff wish us well, and are suitably nice, or well-trained, or both, that we believe them. They are patient as we muddle our way through the self-service tills, or refuse to use the self-service tills, or leave unwanted items on the wrong shelves in the wrong aisles. We hope this is as convenient for them as it is for us. Perhaps more so, as we’re not convinced this is actually convenient for us. Striplit, we all look tired. We are a demographic, observed, studied, debated in plush meeting rooms. We are a potential growth market. A step change. Disruptive. Or steady. A question mark. A decline. We will all return to our homes soon, or soon enough, or later, or much later. We will have almost certainly forgotten something. BTW, I quoted and tweeted it out but forgot to tag you.